The mighty alt-roots trio that is Dosed are on the up and up, and now they’re celebrating the release of a brand new single, ‘Wobbly Van’. 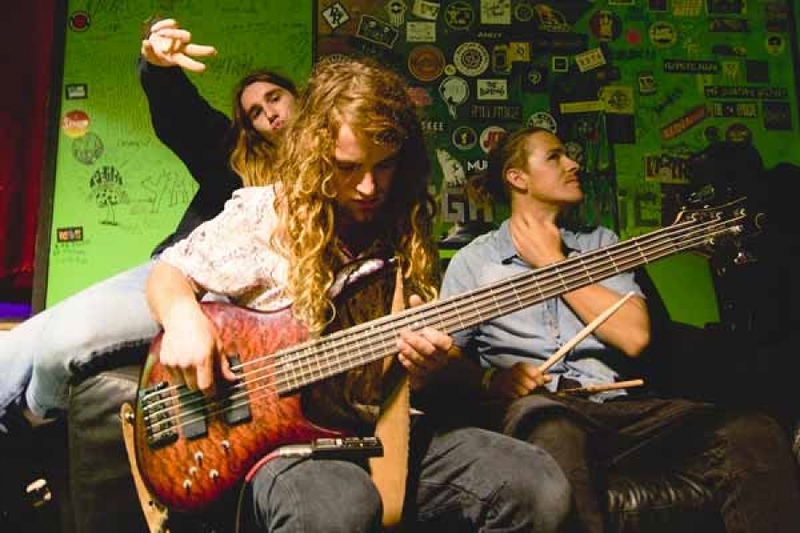 Grease up the wheels, and slam this track in your veh-he-icle as the lads launch ‘Wobbly Van’ at Solbar tonight, with a little help from Brisbane alt-roots outfit, Kurilpa Reach, and Che Burns. The single itself is ska-tinged slammer, sliding into drippy dub, then coming out the other side, all oily and dirty for a rockin’ finish. Sunshine Coast’s very own sock-knockin’-rockers, Dosed, are set to release their second single ‘Reason To Smile’ on November 2. The alt-rock trio from the Hinterland made their way down the mountain in 2017 and have been carving out their sound of 90s rock splashed with punk, funk and reggae. Reason To Smile is a track taken from their upcoming EP, and is the kind of tune that makes the day feel easy. Influencing any occasion with subtly, it’s catchy melody and genuine lyrics walk along a relaxed vibe while still aligning with their dancing ethos. Oskar Campbell, vocals & guitar, explains, “The song is about remembering and enjoying the simple pleasures in life”. From the surface it’s easy to get caught up in its feel-good groove, but a closer listen reveals that the song features lyrics that don’t exactly match up. Oz explains the he was sitting on the melody and the first line, ‘I gotta find a new friend, I’ve been getting bored of myself’, for a while. In a way, the song demonstrates the power that music has. You can start writing or listening to a song in a certain mood and finish up somewhere totally different. The band are keen to follow up from the live version of Reason To Smile which was recorded on Balcony TV in 2017. “It’ll be good to give our listeners the studio version. It’s one of our earlier tracks that we’ve always had in the set list. It’s fun, punchy and gets people going at gigs.” explains drummer Rory Stirton. The official Single Launch is set for November 8 at The Milk Factory in Brisbane. The heritage pub is known for its support for live local music, tasty beers and a keen crowd. The new track from Dosed with be out on all digital streaming platforms on November 2. If you have a listen and get around the launch party, you can bet your your bottom dollar Dosed will be giving you more than one reason to smile. On all ya favourite streaming services! Dosed’s debut single is titled ‘Too Crazy’. Brisbane/ Sunshine Coast alternative rock trio, Dosed release their debut single ‘Too Crazy’ tomorrow. Today, scenestr has an exclusive stream of the track for your listening pleasure. ‘Too Crazy’ was originally written by the group’s lead singer and guitarist, Oskar Campbell, as an application for admittance into university. The track has since evolved and Dosed feel it best encapsulates the energy they create at a live show. “Oz spent a solid week down in the jam room recording all the instruments and then decided to put the vocals in there last minute. We didn’t see him, he only came up for Jatz and cheese at about 3pm each day,” drummer Rory Stirton says. With stated influences including Red Hot Chili Peppers, Sublime and Sticky Fingers, Dosed’s bass player Noah Webbe shares how the trio approach making music. “After a while of playing together we soon discovered we had the most fun playing upbeat music with people really getting into the dancefloor. So we try keep that in mind when writing music. ‘Too Crazy’ will be available on digital streaming services from 29 June. We spent some time in the studio recently. You can expect some tunes to be released and we’ll officially be launching on digital streaming platforms. We have some seriously good stuff in the works and can’t wait to share! On Thursday night Tins & Gigs had a few beers at the The Zoo in Brissy and caught up with Noah, Oskar and Rory from Sunshine Coast based band, Dosed. These guys are Australia’s (if not the worlds) answer to the heart wrenching void that was left behind when Sticky Fingers went on hiatus in early 2017. Their musical finesse & unique guitar riffs leave you feeling like you should be tipping back an ice cold brew and chatting to mates about these musical talents that rate with the likes of Red Hot Chilli Peppers & Thirsty Merc. During our chat we found out that although the boys have been mates since before primary school, not all of them were into music from the start. With frontman Oskar on guitar and vocals, Noah on bass and after Noah’s Dad hooked Rory up with a drum kit, Dosed was formed. After speaking with band manager, Kylie, our suspicions of the bands musical inspirations were confirmed. “Yeah you get pretty bored with the music on road trips with the boys, it’s just RHCP and Sticky Fingers the whole time,” she said with a chuckle. Not to mention the subtle salute to Chilli Peppers track ‘Dosed’ where they got the idea for their band name. We asked these legends what their favourite brew is these days and seemed to be easily pleased with whatever they could get and as long as the funds were there. “Stone & Wood if we can afford it.” Rory laughed. check out the boys unearthed, grab a tin, sit back and wrap your listeners around Dosed and reminisce about the bands that made you fall in love with music from the start.